A short hop today from Emie Shan to Chengdu. First though, a short diversion to Leshan to see the giant statue of the Buddha. At 72m tall it is the largest statue of the future Buddha in the world. 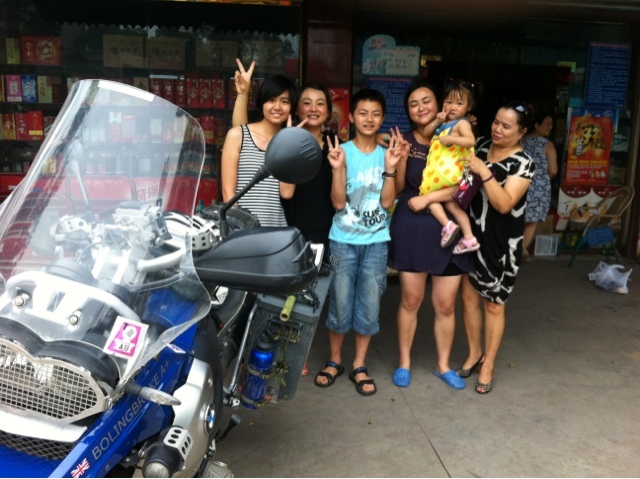 Then through the heavily populated area south of the city to the capital of Szechuan, Chengdu. As you pass through each town you notice how it specialises in one sort of trade. One has nothing but shops selling women's coats. Another is scaffolding poles. Chengdu itself is the home of women's shoe manufacture in China. Lunch was a packet if crisps and a drink from the corner shop run by this lovely family.